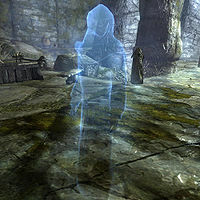 Girduin is the ghost of a Bosmer sorcerer which only exists during impressions of past conversations with the Arch-Mage during the quest The Staff of Magnus. He was the first one to die in Aren's group, killed by the skeletal dragon. He and several other mages including Savos Aren, Hafnar Ice-Fist, Takes-In-Light, Elvali Veren and the group leader, Atmah, embarked on a quest through Labyrinthian. After passing through the room with the skeletal dragon, he is revealed to have been killed by it. Hafnar wishes to go back and save him but Atmah says there wasn't much to go back after. This page was last modified on 5 April 2013, at 16:59.